Gordon Davis, WSU alumnus, educator and 2018 winner of the Ruby C. McSwain Outstanding Philanthropist Award. This week, Davis received the prestigious Ruby C. McSwain Outstanding Philanthropist Award from the National Agricultural Alumni Development Association (NAADA), with WSU leaders in attendance. “Alongside his own students, and among thousands of classrooms nationally, Dr. Davis has been inspiring student success for more than four decades,” said Ron Mittelhammer, Regents Professor and former dean of WSU’s College of Agricultural, Human, and Natural Resource Sciences. Davis’ journey began in 1964, when his family was named the Washington State Dairy Family of the Year. As a teenager, Davis had been entrusted as the herdsman of the dairy, making breeding decisions for the family cows. Davis remembers being “grilled under the willow tree” by Timothy Blosser, chairman of the award selection committee and head of the WSU animal sciences department, about his role in keeping the small Deer Park, Wash., dairy successful. 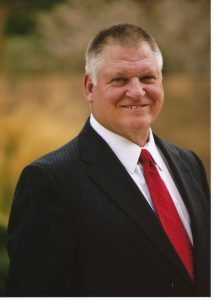 Davis graduated in 1969 with a double degree in agricultural science and agricultural education. He could have received his ag science degree a year earlier, but held off, as it would have kept him from competing with the college’s meats judging team. “Mentally and physically, I’ve yet to see a tougher, more challenging event than intercollegiate meats judging,” he said. Rising at 4 in the morning for practice inside 34-degree walk-in coolers, team members must develop photographic memories, verbal, writing and time management skills, strong work ethics and good judgment. Teammates prepare for more than a year for national championships and international contests, grading beef, pork and lamb. It’s grueling, competitive, and Davis loved it. After graduation, Davis taught high school agriculture for three years in western Washington state before seizing the chance to get back into collegiate judging. “I loved the kids and everything I was doing, but I wanted another challenge.” Davis followed his former WSU coach, Dr. Gary C. Smith, to Texas A&M University, where he earned advanced degrees and helped coach the meats judging team. Five years later, with a newly minted PhD, Davis went to the University of Tennessee as a teacher and researcher, taking the meats team to success as a coach. Next was Texas Tech University, where he taught meat science to graduate students and undergraduates, always recruiting the best to the judging team. Davis was proud to be able to co-coach two national champion teams, in 1973 at Texas A&M, and 1989 at Texas Tech. To this day, Davis receives weekly emails or calls from former students, in particular his judging team members. Many have gone on to lucrative careers and good jobs, but for Davis, what is truly important is how they approach life. “When I asked kids to be on my team, I said, ‘I hope when you’re done, you’re going to be a player in my book,’” he said. 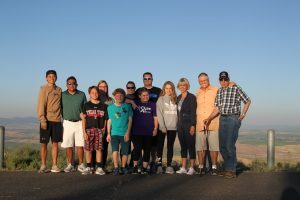 Members of the Davis family visit Steptoe Butte in Washington state. Gordon Davis was inspired by his great-grandfather, “Cashup” Davis, who founded a hotel on the butte’s summit. As a teen, Davis learned from family elders about his great-grandfather. James S. “Cashup” Davis was a storied Palouse pioneer, who founded a store, stagecoach stop, and famous mountaintop hotel on Steptoe Butte, the iconic, 3,600-foot peak rising above rolling hills. In 1990, Davis retired from full-time faculty work to found his educational media company, CEV Multimedia. He had noticed the potential of video in the classroom in the 1970s, and started experimenting with instructional segments to help improve his judging team. “We brought the experts to the classroom, and teachers loved it,” he said. From agricultural science, it expanded into family and consumer science, architecture and construction, health science, criminal justice, business, marketing and finance. Used in 67 colleges and universities, and high schools and middle schools across the nation, the service has 15,000 teacher subscribers, including more than half of all agriculture educators nationwide. Davis, as chair, leads with four partners—three of whom are former members of championship judging teams. With success, Davis gave back. A major supporter of education nationally, Davis has been a vital contributor to CAHNRS, serving on the college’s Land Legacy Committee and the CAHNRS Campaign Council, which helped secure fully a quarter of the entire university’s $1 billion campaign achievement in 2015. He continues to financially support CAHNRS student learning today.